This is the category for major stuff that gets e-mailed out to the people on the mailing list. That first month I mostly felt a sense of loss, a feeling echoed by this other previous volunteer who worked in an orphanage in Peru. You don’t want to let go of the people that you still love that are so far away, but you have to let go a little bit to be able to accept it and move forward. Every time I went shopping after Christmas I found myself just thinking about how much the girls at the Hogar would like everything I saw. I ended up buying some things and sending care packages to the Hogar. I realized later that I sent the packages less because they really needed the stuff, and more because it made me still feel connected to them. In the second month, I am still grieving but don’t find it so crippling. I can now talk about the girls and our experiences without crying. And we’re looking forward to the future. Tom has received a job offer from Boeing to return to similar work as what he was doing when we left, and he will start work the last week of February. I have signed up for a teacher-certification program to be certified in the state of Missouri to teach high school biology. While I study, I will subsitute teach and apply for positions to start in the fall. So our list of achievements is getting longer: cellphone, car and now, job. Next month on the agenda is housing. We are currently leaning on the hospitality of my parents in St. Louis until we can work out the fate of the house we own which has been rented while we were away. An interesting product of the reverse culture shock that we’ve both experienced is a desire for safety and making conservative choices. What I mean is that before, when we were both tired of the ho-hum status quo, we were excited about shaking things up and undertaking this big Bolivia adventure. Now we feel like going to the grocery store is adventurous and that we want a stable and predictable life. How long this feeling will continue before we get bored again, I don’t know. Or maybe this is the new norm, it makes me feel old though. We are now in our last days in Bolivia. We’ve had a whirlwind last two months, finishing up the school year, celebrating Thanksgiving, doing three god-daughter’s birthday parties and traveling for a week in Argentina. Now we’re just packing up our bags, celebrating Madre Clara’s 25th anniversary of her religious vows, and getting on the plane. At 10pm on Monday, December 10th we land in St. Louis and officially end our time as volunteers/missionaries. It’s been an amazing two years, amazingly difficult and amazingly rewarding. Since we want to enjoy the last of our time here as much as possible we haven’t been and won’t be updating the blog until we’re settled stateside. But we promise between now and Christmas to catch you up on all the adventures and fun times we’ve had in November and December. Thank you for reading our blog, please stay-tuned also for post-service reflections. We’ve been told the deepest of the reverse culture shock doesn’t hit until 6 months back so check back in June if you’d like to hear how that’s going. Off to pack, see you all in the US of A! So here we are, teaching our first week of class in the new school year. Its exciting, and more than a bit scary. I am teaching a class for the first time in my life, and though it is on a topic I know very well (Introduction to Multimedia), its in Spanish, which I don’t know as well as I would like. Also, I’m teaching from a text that I’ve spent the last three months writing myself (again in Spanish…with more than a little help from family/friends and google translate). Finally, I’m teaching in a brand-new computer lab that one of the more computer savvy people at the institute and I had to put together from the ground up (and I’m still working the kinks out of)…financed by generous donations from so many awesome people! So needless to say, there’s a lot going into this. Sadly, it is starting off a little more slowly than I would have liked. The vocational schools in Bolivia all start on Feb. 1, however, for the first two weeks of class, there are still students signing up! My first day, I only had two students, but it has been growing steadily. The problem is, however, that each time a new group of students starts the class, I have to go back and go over all the material I already covered…while trying to keep the students who were there on the first day engaged with other work. Not the best scenario for a rookie teacher. All in all, it has been a good experience. The students seem interested in the material, and hungry to learn more about it, so that’s a good sign. I’ve taken a few pictures with students using the lab, and have a short movie below. And while I’m teaching this class, I also still need to finish up the last couple sections of the text…that we’ll be using in a few short months. After spending January preparing my materials to teach English at the Kinder, Madre Clara approached me and asked if I’d be willing to teach Computer class instead as their computer teach had not yet shown up. Embracing the flexibility that Bolivia has taught me, I said no problem with a smile, put aside all my prepared materials and started over from scratch. I spent that first week doing diagnostics of my computer lab- full of the best equipment 1995-1999 had to offer, which would be fine if they worked. Tom taught me some basic computer disassembly and what wires to wiggle. Who would have thought I’d come to Bolivia to learn how to repair computers? Of the 31 computers in there, so far 24 are functioning, which should be interesting when I have a class of 36 come in. Basically my lesson plans involve teaching the parts of the computer, how to properly turn the computers on and off, and how to use the mouse. They have a bunch of educational games they can play also and I’m going to show some movies and teach a little English too. In a few weeks, I’ll start having two classes a day in there. For now, I’m helping out in the classroom with 37 pre-Kinder kids, ages 4-5, as they have the hardest time adjusting to school. Most of the time I’m chasing down kids trying to escape or calming kids having a melt-down. One funny tidbit from the week: Tom came over on Friday to help me film some students in the computer lab. During the beginning of the day when all the students line up and sing songs, there was one boy having a particularly bad melt-down. He had gotten himself so worked up he was throwing up his lunch all over the place and when a female teacher approached him, he looked spooked and ran. He ran right to Tom, and clung. Tom tried to take him to his professor and leave him there but he kept running back to him. So after taking the kid to bathroom to clean him up, Tom had a shadow for about an hour. Everybody was cracking up about it. I guess the kid was a daddy’s-boy. Life in Montero is beginning to have a certain rhythm to it after 4 weeks. You can watch the movie below to see all the places that we live and work and read on if you’d like a more detailed look at a week in our life. You can also view it in 720p here or on YouTube. We get up 6-7am, and eat breakfast in our kitchen, usually bread, jam, margarine and dulce de leche. Then we get a little bit of computer time in before 8:30am. 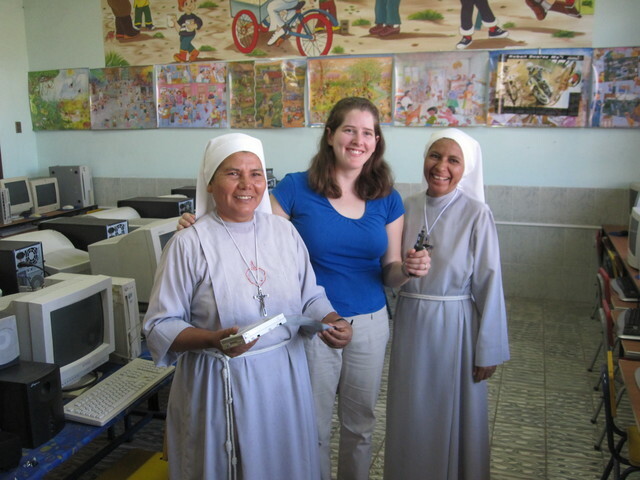 At 8:30am Laura goes to the Guarderia (Day Care/Preschool) for the morning and Tom works on one of various photo or video editing projects that Madre Clara has assigned him, or he works on other odd jobs. Around 12-12:30ish Laura picks up our lunch from the kitchen at the Guarderia and brings it back to our house (about a 200 ft walk). Lunch is always soup, rice and a mixed-up mush of meat and vegetables (made for the kids). Many days they supplement our lunch with extra chicken or vegetables however. At 2pm it’s back to work. Laura and Tom both go to the Kinder (kindergarten). Tom has been working as the official Kinder photographer as well as helping out in computer classes for the kindergarteners. Laura goes into different classrooms everyday to basically be a teaching assistant and learn how to run a classroom in Spanish. At 5pm Kinder gets out and we go back to our house. We eat dinner at 6:30-7ish, usually leftovers from lunch; we try to make it a smaller meal which is the custom here. Then in the evening M, W, F there are classes over at the Institute that Tom might observe or help in and Tues and Thurs. we teach an English class together to high school and college students from 7:30-8:30pm at the Institute. Otherwise evenings are spent relaxing or doing class prep. Saturdays Tom is once again on call for Madre Clara which can mean any number of things from going shopping in Santa Cruz to filming a confirmation ceremony at the prison. We also sometimes work on laundry in the mornings and then Laura prepares for IAM meetings. 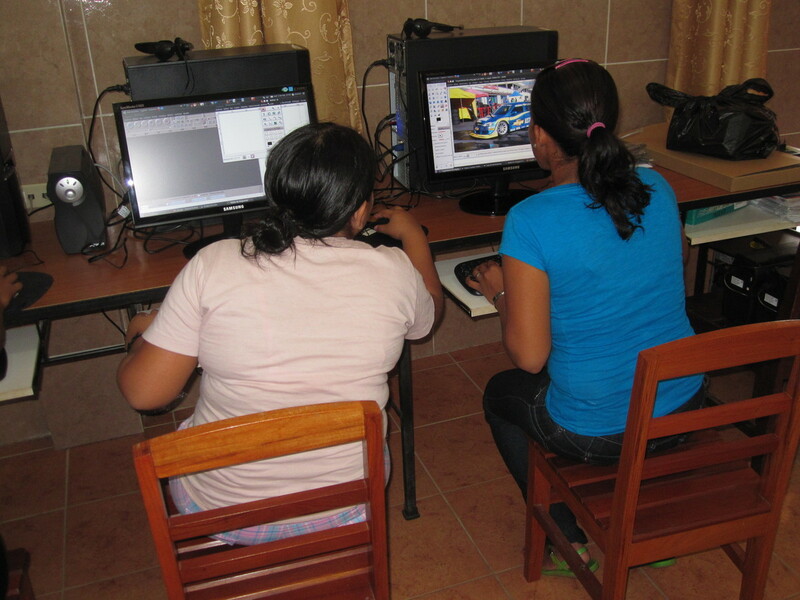 Laura is in charge of a group of the Infancia and Adolescencia Misioneros at the pastoral center Saturdays 3-4pm. Basically it’s a group of young people who pray together and read the Bible and play games. We talk about how to be a Christian in the world and how we pray for all peoples around the world, because we’re all a family. Then 4-5pm Laura stays around for “Seguidores de Cristo” which is a group of high school and young college students. Saturday evenings has become movie night for us, and a chance to take a break from Spanish. Sunday mornings we’re out of the house by 8:30am and head over to the orphanage to help take the girls to church. This involves lots of hand-holding and yelling “Wait!” at intersections at the motorcycles fly by. By 11:30am we’ve generally dropped the girls off back at the orphanage and then we start our actual “off time.” But often Tom will still get conscripted to take video somewhere or there will be some celebration to attend at the pastoral center. It’s hard to really get a full day off when there’s so much going on here. And that’s a week in our life here! All this is just the how things are for the time being. Classes are just getting out for the summer down here, so we’re expecting lots of changes in schedule in the next couple weeks. Then, when the next school year starts in February Tom will be teaching a lot at the Institute. There will definitely be a class on Graphic Design and Multimedia production (there is a lot of demand for these skills at the Newspaper/TV studios) and possibly a class in computer construction/repair and networking. 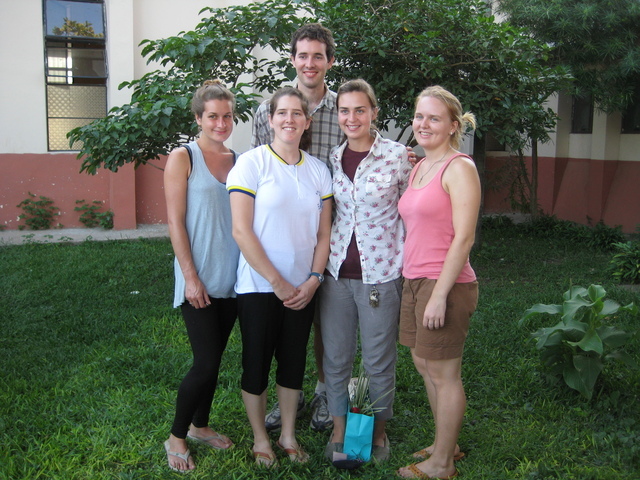 Every afternoon Laura will be teaching english classes to the kindergarten students, and (probably) still working at the Guarderia in the mornings. We’ll be sure to give you an update once we actually start all that after the first of the year. On a more personal note, we’re missing everybody a lot. Its tougher than just moving to a new city has been in the past, as all our cultural norms and customs changed along with our move. We’re on the internet fairly frequently, so if you ever see us on facebook, google, or skype don’t hesitate to say hi (also our old phone number 314-266-8359 still works, and is free). Hope everyone is enjoying reading our blog!